From their days as an indie-rock band with punk roots on an upstart Metal Blade Records in the late-‘80s, to their present status as one of the premier Top 40 rock bands in America, the Goo Goo Dolls have been defined by a single constant: Damn-near perfect songs. With the May release of Let Love In, the band’s eighth studio album and tenth release overall, frontman John Rzeznik and bassist Robby Takac have returned with eleven tracks ripe for radio and primed to conquer mainstream America. Days after completing a six-week club tour that debuted the new material, Maximum Ink caught up with the bassist to discuss the evolution of the Goo Goo Dolls, and life as a pop culture staple. 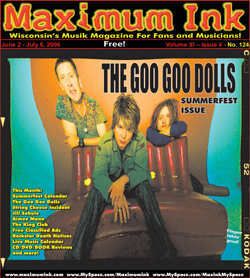 MAX INK: I have to preface this whole interview by saying that I’m one of the only people I know who’s listened to the Goo Goo Dolls since the beginning, and am a bigger fan of your newer material. That said, I saw the Los Angeles show at the Troubadour, and I was a little disappointed that the set wasn’t customized for the club setting. I felt like the intimacy of the club was lost when you performed the same set you would have done in an amphitheater. ROBBY TAKAC: It’s really interesting that you say that, because we’re at this really weird point right now where after twenty years of making music, the first seven or eight years have worked their way out of the set due to the fact that it’s always been important for us to be relevant, and to not feel like we’re resting on the laurels of our past achievements. Being one of the few bands that’s been around for the past twenty years is a unique position to be in… I don’t know if you noticed, but we didn’t play “Name” that night. John and I were talking about it backstage, and actually got in a huge argument over it, because I was like, “You’re gonna piss a lot of people off if we don’t play that song.” There is going to be a select group of people there that are only there to hear that song, because our songs are mainstream songs now. That song is the soundtrack to a part of someone’s life, and that’s a song that they come to hear you play. I understand that, and I don’t have a problem with that, but we’ve been wrestling with that whole thing a lot lately. The one thing I do know, is that we can walk up on the stage and have a body of work that can touch everybody in that room at one point in the night. It’s hard to stray away from having that experience with those people, you know what I mean? MI: I think that’s one of the things that makes me appreciate the band so much, I feel like we’ve grown together, albeit on different paths. RT: Exactly… We went back to Buffalo to record this record, and I read a couple reviews that said they were disappointed because they expected to hear something more like Jed. I have to laugh about that, because that wasn’t why we went back there. We went back there because we wanted to make that next step of growth that we were comfortable with as people, as the Goo Goo Dolls. It wasn’t about being a garage band and not a Top 40 band. We were thinking about our lives, what was going to go on for the next few years, and having to deliver these songs on a daily basis. They needed to be songs that we could feel comfortable playing, and the next step had to be one that we could be proud of. So I know what you’re saying. There is a longing for some sort of nostalgic thing after a band’s been together for so long, but up, up and away… That’s why we actually ended up playing almost the entire new record at that Troubador show. MI: It was a club tour. Was it really necessary to have five musicians onstage? RT: That’s our weapon of choice right now, you know what I mean [laughing]… The idea of that month-and-a-half was to hone that weapon. It feels really good to walk into a room that size and represent a rock show that can be that big. Is it necessary? Absolutely not! But Paris Hilton isn’t necessary either, and she’s doing alright. Sometimes it’s important to be larger than life. MI: I still think it sounded too perfect for a club show I expect that in an amphitheater, but in a club setting, I’d rather see John play guitar than watch two other guitarists play as he just lets it hang around his neck like eye candy. RT: John has been playing less and less guitar, and that’s another conversation we’ve been having lately! [Laughing] He’s convinced that his guitar playing makes us feel more like a bar band… When it comes down to it, I think he just wants to be freed up a bit, and he’s looking for that little something extra to stir things up. MI: Can you look back and see a single point where you realized, “Wow, we can make that jump from garage band to mainstream act…”? RT: I think there was a point where we realized that we were starting to grow as a band, and we’re starting to become adults. Sure, we used to laugh and go, “Wow, I wonder if this could be a hit?” but we were never looking at each other and thinking that we were doing something we shouldn’t be doing. We’re a singles band, and that’s something we’ve dealt with our whole career, as far back as “We Are The Normal.” Back further than that, even: “James Dean,” from the Jed record, was played way more than everything else as far as college radio went. That’s always been a big part of what this band has had to offer. MI: “Give A Little Bit” was a single from your live album while you were recording Let Love In, so why include it on the album? Even though it’s a Supertramp cover, it does seem like a perfect fit on the record, and even sounds like it could be a Goo Goo Dolls song, but you’ve never had a problem writing songs. Why include it? RT: That’s how it ended up on there! This is the first album that we ever had B-sides for, and that’s one of the reasons why. “Give A Little Bit” was always in the orbit… Not to get schmaltzy on you, but we were doing the record, and we ended up with this weird off-season success with a cover song in the midst of toiling with the new album. Then New Orleans happens, America is dealing with Katrina, and as we are writing the lyrics for the record, a song like “Give A Little Bit” seemed to fit the theme of the record so well that we edited it in. MI: How did it feel to have CNN embrace “Better Days” the way they did and have it be forever connected to New Orleans and Katrina? RT: I think that any time you can have an affect on someone, or some situation, by complete and utter coincidence, it adds a whole dimension to things that you never think about… It’s going to seem like I’m going off track here, but I’ll come back around, trust me! People ask me, “How can you play the same songs night after night after night after night?” It’s super easy, because you’re standing out there staring at people that are singing the words with you, and if they have half a brain, they’re trying to figure out what these songs are about. You know what? So am I, and you’re looking people in the eye and it’s the closest to channeling that you can ever get. These words came out of your brain when you were in your room freaking out about something, and they’re looking at you singing it back to you and they think that they know what it’s about. And they do, because it means something to them. With “Better Days,” it’s the same thing, but on such a more enormous level. We played “Iris” at that concert for New York after 9/11, where it was all firemen, police and rescue workers, and when we broke into “American Girl,” for me, that was the day that somebody lifted that black cloth off of New York City. That was a moment, and if I can connect that song to that here’s where we come back around that’s why we need to play “Name” in our set. That song moved people, and they deserve to hear that song and feel what they come to the show to feel. Being a part of that just makes it mean that much more to me. The Goo Goo Dolls will headline Milwaukee’s Summerfest July 9 at the Marcus Amphitheatre, with the Counting Crows, then return Aug. 18. to the First Midwest Bank Amphitheatre, in Tinley Park, IL.